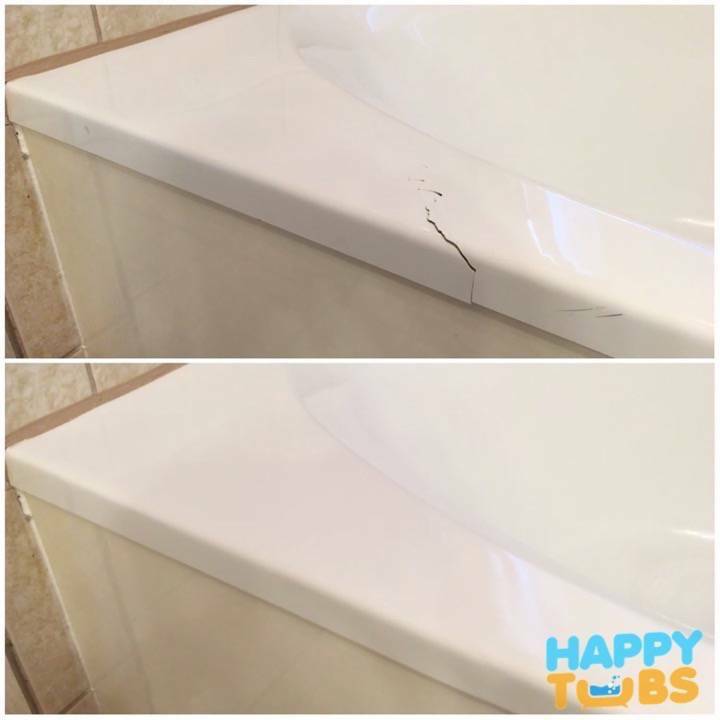 Bathtub Crack Repair by Happy Tubs. We specialize in bathtub crack repair. Most bathtub crack repairs are completed in under 2 hours and for only $299! You will even be able to use your bathtub the very next day. We are proud to use the highest quality Made in America materials. It's how we ensure the quality and durability of your bathtub crack repair. With our bathtub crack repair service you will get a "best in the business" Fully Transferable Warranty! text or email us a picture of the entire bathtub, including one of any cracks (place a dollar bill for size reference). include the name and number of the person we should contact with repair options and accurate cost information for your bathtub crack repair. sit back and relax while we prepare and send you all of the information for your bathtub crack repair. We are proud to be the highest rated Bathtub Crack Repair company in the DFW area to be Authorized Service Representatives for warranty service and we also specialize in repairing jetted bathtubs by the following manufacturers. It gives us inside access to the best methods and parts for your jetted tub repair needs. we have 1 Hour appointment windows! "Arnold and his assistant arrived right on time, repaired the crack in my tub and left everything clean. The tub looks good as new and feels stronger than before. All for a realistic price!" "had another tub business cancel and reschedule FOUR times. Arnold called me right back and actually showed up a bit early so I could get to work and start my day. Terrific job! Left everything clean and made my day." "The bathtub looks like brand new and my wife couldn't be happier. I can't even tell where the chip repair is. Highly recommended for their friendliness and professionalism!" "Outstanding Customer Service from the initial contact to the finished product!! I am very happy with the bathtub chip repairs and with how easy everything was!!!" "I fell and my heel punctured my built in bath tub. Found Happy Tubs by a search and the owner CLEARLY explained my tub repair. Also cost about 1/10th of replacing the tub. you DO NOT SEE the hole repair. AMAZING!" "Great company to work with and excellent follow up. Had 4 fixtures re caulked and everything looks great!!! Cleanup was spot on and even came back for a quick fix. Truly look to make their customers happy. Highly recommended!!!" "Arnold and his team arrived right on time during our agreed upon 1-hour window! They did a great job fixing my Jacuzzi and explained everything to me along the way. They left the house clean and stuck to their e-mail estimated price." "We really appreciated the time spent, his knowledge, and a well repaired shower pan. You can't go wrong with Happy Tubs for shower repair. We will definitely be calling Arnold if any other problems arise!" "He was super knowledgeable, explaining and showing me every step of the process. He was also able to completely remove the bad refinish job someone else did and completely restore my tub! It looks amazing. I would refer them in a heart beat." "I am extremely satisfied with Arnold from Happy Tubs and the bathtub restoration he did. I whole-heartedly recommend him. You can't ask for a better looking restoration. Your tub will be in good hands." 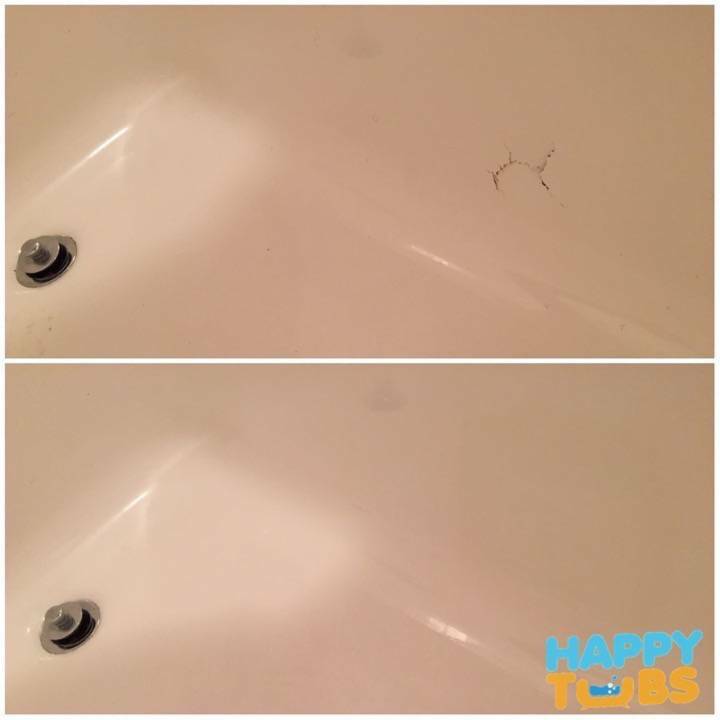 "Happy Tubs came out for a bath tub crack repair. Arnold did an incredible job - my garden tub looks brand new! Happy Tubs is quick, responsive, and does a beautiful job - I highly recommend them." "Today, after almost two hours of work on it, Arnold showed me my "new and improved" tub! You can't tell there was even a crack on it to begin with, he was that good. I recommend Happy Tubs for bathtub crack repairs!" "Arnold was quick with a response. Showed up the next morning on short notice and was on time. The chip repair was finished within an hour and a half and it looks impeccable. I'll just have to be careful not to chip the tub again!" "After a leak was found in our Jacuzzi tub during the home inspection, we almost lost the sale because I couldn't find anyone that repairs jetted tubs. Happy Tubs was quick with a response and fixed my Jacuzzi in 1 day, very clear and reasonable price too!" "My toddler burnt out the grandparents Jacuzzi tub pump and we couldn't find anyone to fix it. Once I found Happy Tubs, they took care of the Jacuzzi repair right away and were even able to get through the tile for the pump replacement. Highly recommended!" "The switch in my jetted tub was stuck down for months, apparently plumbers don't fix jetted tubs. My handyman told me about Happy Tubs and they replaced it on the first trip. I would recommend." "Happy Tubs was a pleasure to do business with. Just like my realtor said, they came on time, fixed the leaking jet in my jacuzzi tub and closed everything back up. They even had a way to get the jacuzzi clean again!" How much do bathtub crack repairs cost? How long before I can use my bathtub again? For most repairs the bathtub can be used the very next day! Most crack repairs are completely invisible to the eye. Some of our clients have a hard time remembering where the damage was! Do you use an epoxy? No, epoxies are good for some applications, but will not last in the long term. Instead we use a very high end filler for your bathtub crack repair. We believe in only using the best available in order to give you the strongest possible repair. How long will the repair last? The crack repair itself is permanent, while the paint (to blend it in to the rest of the tub) will last an average of 10-15 years. Do i need to do anything to prepare? Other than removing any personal items from the bathtub, you can sit back and relax. We will do all of the work and cleanup. What kind of cracks can you repair? your contact information so we can call you with an accurate price. We first asses the damage and come up with a plan to make sure that the repair will be permanent and last as long as possible. 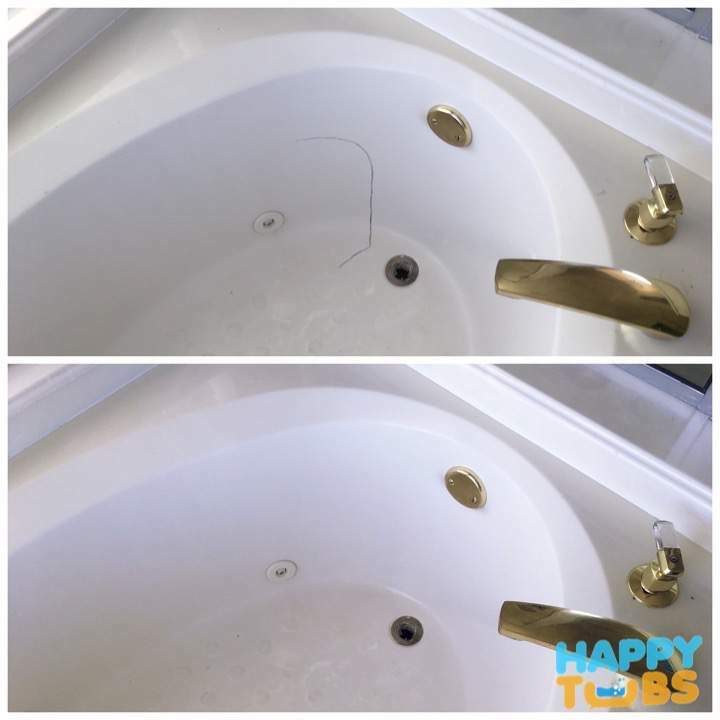 Bathtub crack repairs for example require opening of the cracked area in order to clean out the crack and ensure a complete repair. We then stop the crack from expanding any further and clean the surface with a solvent. We apply a High Strength Crack Repair Filler in several stages allowing for a proper cure in between. After the filler is allowed to fully cure it is then sanded down to match the contours of the bathtub. In some cases the bathtub repair has to be much stronger than the surrounding bathtub (it did crack in the first place), in those cases we overbuild the repair in order to provide strength. Sometimes it pays to sacrifice looks for durability. We then match our 4K Acrylic Poly-Urethane coating to the rest of the bathtub in order to have a flawless bathtub crack repair. The bathtub can be used after only 24 hours! We come to you on time, every time and use the latest equipment for your bathtub repair. We also provide you with a Fully Transferable Warranty, as well as Care and Maintenance Instructions. Local, family owned business with thousands of bathtub repairs and jetted tub repairs under our belt. We constantly keep up to date with training on the latest techniques, materials and parts. We use the highest quality materials for your bathtub repair and the highest quality parts for your Jetted Tub Repair and stand behind all our work with a fully transferrable warranty.